I’m admittedly not a huge follower of politics on either a domestic or international scale. I stay just informed enough to be able to follow a political conversation, but certainly not enough to contribute significantly to it in the way of detailed information about any one individual or situation. But about a month ago, I heard the story of a political figure that both intrigued and inspired me. 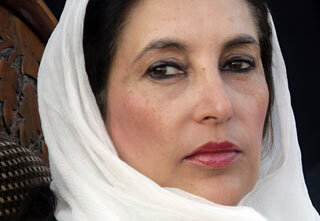 Her name: Benazir Bhutto, and at the time she was the subject of a piece on NPR’s Morning Edition. The correspondent was speaking to her by phone, the only means possible because she had been sequestered inside of her own home, placed under house arrest after announcing that she would lead a protest rally against the ‘self-elected’ Pakistani leader, Pervez Musharraf. My mind reeled at the idea that a major political figure – a former Prime Minister of her country – could be so openly and unabashedly intimidated with very little backlash from the international community. But what struck me even more than that was how absolutely undaunted Bhutto sounded about the whole ordeal. Apparently, she was accustomed to the use of such heavy-handed tactics to silence her. Her voice was confident and strong, her tone almost flippant despite the fact that there were about 4,000 armed policemen on the road leading up to and even within the gates surrounding her home. She quipped to the interviewer that earlier in the day she had asked one of the guards in front of her house, “Should you be here? Shouldn’t you be looking for Osama Bin Laden?” With such an effortless display of wit, this woman had instantly won my allegiance. As the interview continued, I remarked to myself that she didn’t speak in the soft, placating manner that I associated with almost all of the Indian and Pakistani women I knew personally. It was clear to me why a woman like this, and especially one in that part of the world should have so many enemies. Yet even in the midst of an attempt to render her powerless, I could tell that not only was Bhutto assured of her power but she also knew how to deftly wield it to influence the world around her. This morning, I heard mention of Bhutto’s name again on the radio. This time, the reporter was announcing that she had been attacked after leaving a campaign rally in Rawalpindi. At first, the report was only that she had been badly injured by a man who fired shots in her direction and then detonated a bomb strapped to himself. But a few minutes later, the reporter gave an update confirming that Benazir Bhutto had in fact been killed by the attacker, and she was pronounced dead after arriving at a nearby hospital. I stood shocked, half-listening as more details poured out of the radio on the assassination of this charismatic woman that had caught my attention only a few weeks before. I said a quick prayer that her spirit would find its way to a peaceful resting place now that it had accomplished its task here. For undoubtedly, Benazir Bhutto’s spirit will continue to be felt in her absence, even if only by an unlikely listener half a world away who will always remember the morning she heard a voice that refused to be silenced even in the face of violent opposition. I think Benazir Bhutto learned some valuable lessons about what is truly important in conjunction with her tenure as Prime Minister and and her subsequent exile. 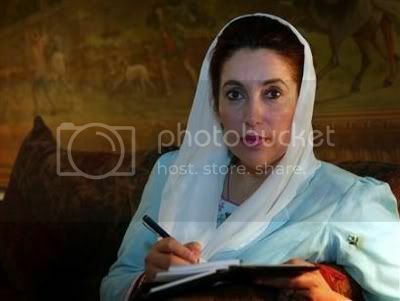 During her time as Prime Minister she was racked with scandal and political intrigue, and after she lost her struggle to remain PM she went into exile, where I believe she was able to see what really mattered–not her own agenda and interests, but the rights of the Pakistani people to live free and follow democratic principles. She was a flawed politician who came around to seeing that though she was from a political family, that did not entitle her to being a leader–only the will of her people could do that. In the end she was a fine example of someone who was strong, courageous and resilient…for all the right reasons this time.